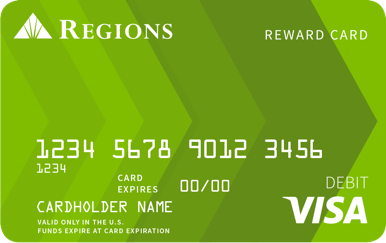 Refer a Friend to Regions and Get a $50 Visa® Reward Card. When you refer a friend that opens a new Regions personal LifeGreen® checking account or business checking account and fulfills all requirements of the offer. Register by completing the form above. Provide contact information and a valid email address for the friend (friend, family member, or business) you are referring or share the offer using available social media. Your friend will receive an email notification containing registration instructions and the requirements of the offer. Complete the entire registration process, agreeing to the Program Rules. Open a new Regions personal LifeGreen Checking account with a Regions Visa CheckCard within 90 days of the initial email communication or the social media communication initiated by you through the official means of the program. Keep new account open and in good standing for at least 60 days. Have at least $300 or more ACH direct deposit (such as reoccurring payroll or government benefit deposit). Complete at least ten Visa CheckCard purchases that post to the account. Sign up for Online Banking with Online Statements (A Social Security or Taxpayer Identification Number is needed for enrollment. Personal account holders may visit a branch to determine if they are eligible for alternative enrollment methods if they do not have a Social Security or Taxpayer Identification Number). Open a new Regions business checking account with a Regions Visa CheckCard within 90 days of the initial email communication or the social media communication initiated by you through the official means of the program. Make an opening deposit of at least $500. Complete at least one Visa Business CheckCard purchase that posts to the account. Sign up for Online Banking with Online Statements (A Social Security or Taxpayer Identification Number is needed for enrollment). This Reward Card offer is not available if the referred Friend or Business already has a Regions checking account, and may not be combined with other offers. The processing and delivery of the Reward Cards may take 4-6 weeks after all conditions are met. When opening the Regions personal LifeGreen or business checking account, the referred Friend or Business must provide the same email address that was used to register. This program may be discontinued or changed at any time without notice. Employees of Regions Bank, Regions Financial Corporation or affiliates are not eligible for this program. Personal LifeGreen checking accounts require a $25 minimum opening deposit. The Annual Percentage Yield (APY) paid on LifeGreen Preferred Checking® accounts is based on balance and as of 02/01/2015 was 0.01% for all balances and for Regions Business Interest Checking Accounts is based on balance and was 0.01% for all balances. Regions may change the APY at any time. Fees may reduce earnings. No interest is paid on other personal LifeGreen or Regions Business checking accounts. A monthly fee may apply depending on account type, but may be waived on some accounts if certain conditions are met (visit regions.com for conditions). For accounts opened in Iowa, certain account fees are subject to Iowa State Tax of 6%, which will be assessed at the time the fee is charged, unless exempt. All checking accounts are subject to the Regions Deposit Agreement. Taxes are the responsibility of the recipient.